Rumor: DROID 2 Out in Favor of DROID 2 Global? 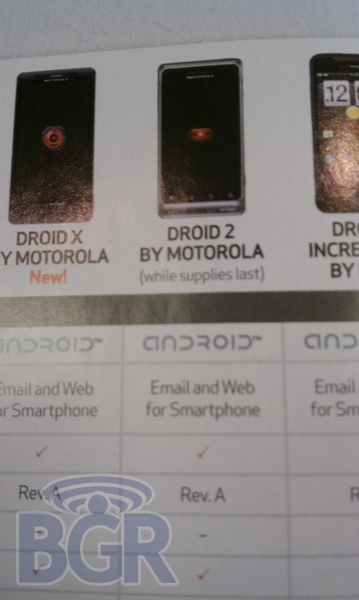 Recent purchasers of the Droid 2 might want to skip by this article; it might ruin your weekend. A sneaky little rumor just surfaced from BGR which shows a shot of the current Droid lineup on Verizon only with some choice words listed specifically under the D2. As you can see above, the words “while supplies last” are clearly displayed and that’s not a good sign for a device that’s been out for about a month. Would Big Red really drop a device just a few months after it arrives? I guess they did decide to skip the whole promotional tour for it and maybe we should have taken that as a pretty big hint? We know that there is a Droid 2 Global coming out at some point this year which should have a couple of upgraded specs, but why would VZW even release the original D2 knowing that it had a short 3-4 month lifespan? And you thought Eris owners were pissed at this morning’s news. So DROID X 2.2 Update, What's the Deal?